Initially, the treaty was signed by the Soviet Union, United States and United Kingdom, the world’s first nuclear states. Since that time, 108 countries have signed the treaty. The signatories include six of the nine nuclear armed states, minus France, China and North Korea. Even so, the treaty created an international norm against atmospheric nuclear tests. It’s been 33 years since the last atmospheric nuclear test. Even North Korea performed each of its three nuclear tests underground. At the time the treaty was signed, nuclear testing was not uncommon. Growing concerns over the health impacts suffered by downwinders – those who lived “down wind” of testing sites around the world – and fears around increased levels of radioactive contamination in Earth’s atmosphere contributed to the creation of the LTBT. By moving testing underground, worldwide exposure to nuclear fallout began to approach natural levels and incidents of downwinder exposure immediately after a test was reduced, though not entirely eliminated. Perhaps most importantly, the LTBT established a framework for the Comprehensive Test Ban Treaty (CTBT), which once in force would ban all explosive nuclear testing. 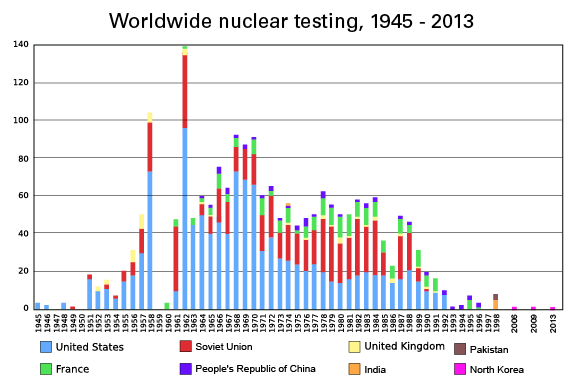 Over 180 nations have already signed the CTBT, further strengthening the international norm against testing. Despite the global support for the treaty, it has not come fully into force – pending ratification by countries including the U.S., China, Egypt, Iran and North Korea. In the U.S., a moratorium has been in place since 1992, and the State Department remains committed to securing ratification of the treaty by the full Senate. The debate on ratification of the CTBT would not be possible today without the success of the LTBT in limiting testing and reducing the increased levels of atmospheric radiation.